Fear not the chaos– that space where we fall apart, where creativity flows. Where systems are deconstructed so that we may rise like the Phoenix from the ashes. Yes, it’s scary. Exploring our edges is fundamentally a source of discomfort. Discomfort at leaving the relative safety of that which is known, and the fear of what we may discover out beyond our current boundaries. Seriously, we’ve all experienced chaos on our farms, especially in the early years. In a certain sense, we almost thrive on it and love the adrenaline rush of crisis management. On top of it all, we’re actually really skilled at responding chaos and love the creativity and ‘freedom’ of it. While the ability to respond to chaos is super useful, we need to be mindful not to get stuck in a pattern of chaos on the farm. Ultimately, we need to kick this addiction to chaos if we are to build a farm that is to more fully support the lifestyle we would love to live (while at the same time accepting that there are times when we’ll be called upon to embrace the chaos at certain moments!). 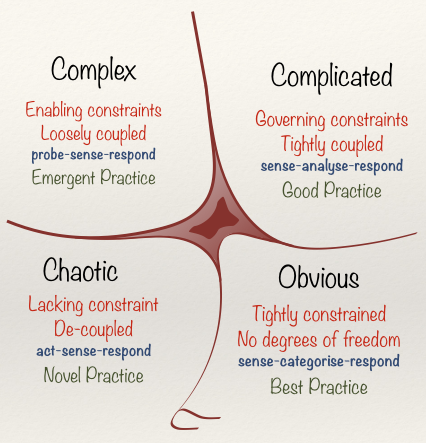 I’d like to share with you this interesting framework for understanding how organizational systems can shift and evolve: The Cynefin Framework. There’s also a great chart on page 7 of this article that really lays out the differences between the 4 contexts, the roles of the leader in each context, and some common pitfalls to watch out for. What I appreciate most about this framework is that it lays out the different roles of leaders depending on each of the 4 contexts: Complex, Complicated, Simple (aka Obvious), and Chaotic. One major shift in terms of farm leadership that I see emerging more and more on small scale organic farms is the shift from Command-and-Control (which is appropriate in a chaotic context) to a role of guidance and support for the farm’s crew (which is essential allow for the emergence and discovery of patterns in a complex context) while developing the clear protocols and systems for the areas of the farm where a simple context is appropriate. The key is to realize that at any one moment there are multiple contexts at play in different areas of the farm… but the bottom line is that the time has come to shift away from the dominance of the chaotic context on small scale organic farms! Which context the most present on your farm? What organizational shift is currently seeking to emerge? What is required of you as a leader to take your farm to the next level? What is your farming superpower?? It’s easy to think that you need to do it all on the farm! I mean, of course, you can do just about any job on the farm faster and better than any employee. However, the creation of a farm that fully supports the lifestyle you would love to live demands that you build a team and fully step into your role of captain and business owner. Many of us make the shift from being employees to being self-employed… but the time has come to make the shift from self-employed to entrepreneur. Find out what your superpower by asking the questions below. Remember to leverage your time by doing the one thing that only you can do that no one else can and yet produces or dictates the course of the farm. An example would be finding connections that would benefit the farm’s supply pipeline for raw materials or choosing the best applications that will fit your farm. Whatever it is, you have a superpower within you and each of your team member has their own superpowers too. What do you do best on the farm? How can you use your time in the most leveraged manner possible? Here is a chart you can fill out to help you reflect on which tasks would be easy to delegate, which tasks would be harder to delegate, and which tasks are really your superpower. It’s a google spreadsheet, so just click ‘save a copy in my drive’ under the ‘file’ menu and you can have your very own version to edit! What would become possible in your life if you spent most of your time focusing on your superpower? If all else stayed the same on the farm this year, which task could you delegate that would have the greatest impact on moving you towards the lifestyle you would love to live? ﻿Building regenerative organic farming systems founded on true human sustainability! As farming nerds, we love talking about crop rotations, low-till/no-till methods, cover crops, composting, community-based marketing systems, alternatives to agro-chemicals, mechanical weed control, irrigation, food hubs, cation balancing, locally adaptive seed varieties, composting, and so on. We can spend hours and hours just going through these exciting subjects. But, have you ever considered that all this rests on the shoulders of humans? It’s all well and good to design the most awesome regenerative farming systems, but it’s all for naught if we’re exhausted and burned out. It breaks my heart to see so many great farmers burning the candle at both ends and experiencing burn-out, exhaustion, relationship breakdown/separation, and the feeling that the farm is running their lives. Not to mention, that all this doesn’t do much good to inspire the next generation to step in and continue building on all the great work that has been done up until now. ‘Certified Organic’ is no longer enough. While it’s a great baseline (and a huge improvement over traditional chemical farming), it’s time to set our sights on systems that are not only toxic-free but rather, on systems that regenerate the health and wellness of the ecosystems and overall well-being of the humans sustained by these ecosystems. Implementation is the key: In order for a regenerative system to be implemented, it requires a human (you and me) to do it. Building Sustainable Lifestyles. You and I are so much more effective when we are energized, well-rested, fulfilled, nurtured and stimulated by our lives. 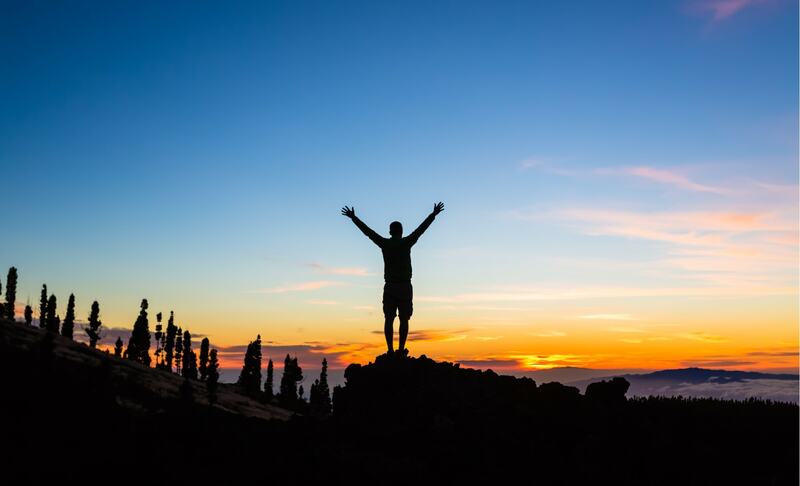 What are the key activities and routines that regenerate and re-energize you? What is one such activity or routine that you are willing to integrate into your week in a non-negotiable manner? What’s it like for you when you are in a state of peak performance… in the flow? What are the key elements that reliably get you into that state of being? P.S: Have you heard of John Kempf? Originally from an Amish background, John is the founder of AEA and the host of the regenerative agriculture podcast. I met John while we were both taking the Marketing Seminar with Seth Godin. I was really impressed with John’s innovative and out-of-the-box approach to organic fertility management. It was a refreshing alternative, yet science-based, perspective to the organic NPK approach promoted by most of the organic agronomists up here in Quebec.